Everyone knows a Pumpkin Soup – a sweetish comfort food, often spiced with nutmeg or cinnamon, and topped with vinegar and pumpkin seeds. However, a pumpkin flavour is more versatile than you think – you just need to mix the right type of pumpkin with the correct spices, and end up with an infinite number of different dishes! Besides, you’d will be surprised how many health benefits an average pumpkin has, which give you a great reason to experiment with this famous berry! Our version of a pumpkin soup is warming and rich in flavour, with a sour and slightly tangy note of tamarind. The taste is so addictive, you won’t be able to stop eating it! Step 1. Put tamarind in 100 ml of warm water and put aside to soak. Step 2 . Cut, peel and de-seed your pumpkin. Add pumpkin to the pot, cover with water (the water should be about 1 cm above the pumpkin) and boil it until you can mash it with a fork, for about 20 minutes. Step 3. When ready, mash pumpkin in the same pot with a hand mixer, or process in a blender together with the water in which it was boiled. It should have a consistency of a thin puree. Step 4. In a small amount of oil or ghee fry garlic and ginger until they release the aroma. Mix with the pumpkin puree, and bring to boil again. Step 5. Remove tamarind pulp form the water where it was soaked, squeeze the pulp to get out the water it has absorbed. Mix tamarind water with the pumpkin puree, add salt and boil for another 3 minutes. 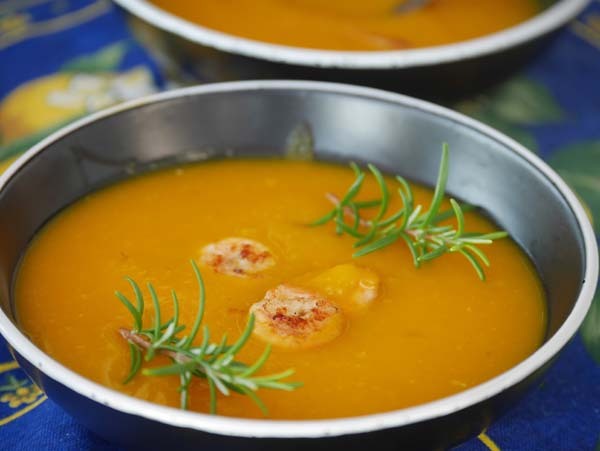 Your delicious and warming pumpkin/butternut squash soup is ready, enjoy!